It was just supposed to be lunch between a mother and her son. "He was having double vision, and it's like 'let's go get an MRI and let's grab lunch when you're done, and we never came home," Gina Kell-Spehn recalled. But a routine checkup turned out to be so much more. "It's been my worst nightmare. When this whole thing started he had been diagnosed with Grade 4 Glioblastoma and that's a tough type of cancer," Sam's mother added. But since that day on November 12th, the healing process and continued fight have prevailed. Support from surrounding communities poured in for Sam and his family. A packed gym for Sam's first love, basketball, was one event to help prove that tragedy can bring out the best in humanity. Sam coached his friends and family against people from the community, and we wanted to help fuel his desire for life through the game he loves so much. "On behalf of the entire Channel 7 news team, specifically Justin Rose of the 7 Sports team, it is formally requested that Sam Kell join head coach Greg Kampe and the University of Oakland Golden Grizzlies men's basketball team on their bench as an honorary team member," read WXYZ Meteorologist Dave Rexroth, who played in the charity game. So last Friday on senior night, Sam took it all in. "His name is Sam Kell, he's a freshman at Stoney Creek High School and Sam, I understand you're a big time basketball fan," belted WDFN play by play announcer Neil Ruhl who hosted Sam during halftime of the game. "Yeah I am. I play basketball at Stoney Creek High School, so this was awesome," Kell said during the broadcast. Sam had a night to remember as players included him in all the festivities. For one night, he could forget about his fight with this disease. It seemed like Friday night was where this uplifting story ended, but after six weeks of proton therapy in Chicago, Sam Kell has made it back for 11 of his freshman team’s games. He also starts now and stays in the game down the stretch, proving once again that the power of sports cannot be underestimated. 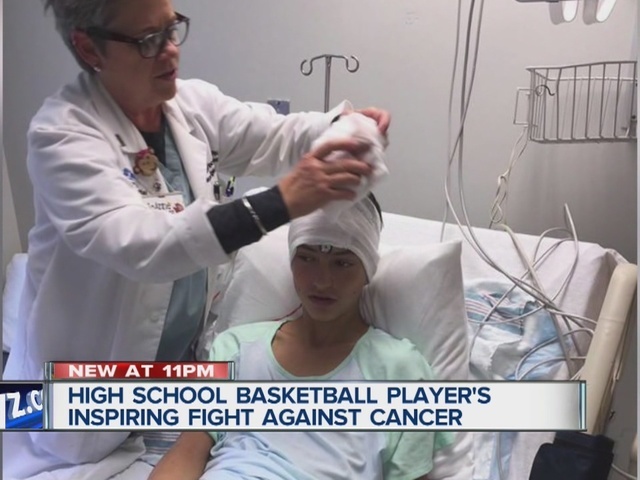 "I think a driving force behind getting well, keeping his attitude strong, the entire time he went through proton therapy in Chicago, every single day he asked to go to the gym to play basketball," Gina added. "I had a lot of doubts, but I had a lot of hope to go with those doubts. If it's anything that Sam loves, it's the game of basketball, so I knew that if it was possible, he would be here," Sam's father and coach Michael Spehn said. "This is the best possible outcome for walking into brain surgery and all that was unknown. For him to be on a basketball court right now is incredible," Gina added. "I didn't want to be known as the sick kid," Sam Kell said. "I was just trying to get things back to where I was… Just Sam. I'm glad how things are going for what the circumstances were," Sam added. "He's got an incredible attitude and a really strong faith, because with God all things are possible, with Sam, his favorite bible verse that he quotes all the time is 'I can do all things thru Christ who gives me strength,'" Gina added. "In the end, Sammy's a 14-year-old kid who wants to play ball and nothing -- not even cancer -- was going to stop him," Michael added. The Kells tell me that they’re taking this day-by-day, and that their goal each day, is to smile as much as possible.